Successfully Added Cell Phone "LevelUP" - Dual SIM, QWERTY, Quad Band, NES Gaming System to your Shopping Cart. Presenting the next level up in smart phone innovation - The LevelUP worldphone with quad band, dual SIM functionality, swivel QWERTY keyboard and Nintendo D-pad, and you guessed it - download and play all your favorite NES games! Everything you ever wanted from a phone - and more! LevelUP your communications - The LevelUP is a first class quad-band mobile phone that supports the four global standard GSM frequencies (850MHz, 900MHz, 1800MHz, 1900MHz) so you can trust it to work anywhere in the world. It has two SIM card slots (dual-SIM) which is perfect for people who want to keep two active phone numbers (personal and business) inside one great phone. That's not all! The CVEM-M94 comes fully unlocked, meaning you can use it with any GSM cellular network provider! LevelUP your entertainment - The LevelUP is a first class retro gaming system. Go old school and play all your favorite Nintendo games from the dawn of gaming. Remember these childhood favorites? But if that were all, this wouldn't be a Chinavasion phone would it? The LevelUp also comes with digital camera and camcorder functionality, it plays music and videos, and even has cool productivity tools to help keep life organized. 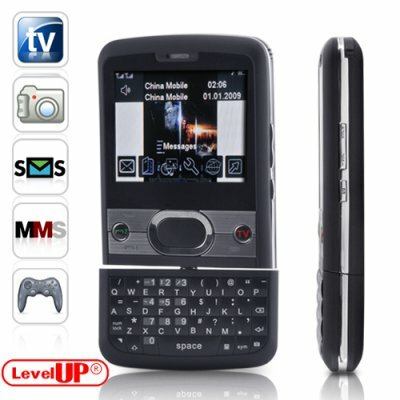 The LevelUP is a staff favorite and sure to be a bestseller - place your orders now on this amazing rotating keyboard worldphone before it sells out - brought to you by the online leader in direct from China wholesale electronics - Chinavasion! Disclaimer: While you can download game ROM's for console systems on various websites on the internet you should own the game titles of the "backup" game ROM's you download. Chinavasion cannot be held legally responsible for the download of ROM's or similar files onto the LevelUP phone. NES Roms conform to MyNES [http://mynes.sourceforge.net/] one of the most popular standards on the Internet. You can use the sound recorder function for voice memos or to record phone conversations. If you're interesting in recording phone conversation, simple answer the call and an options box will appear. Click on it and you will have access to the sound recorder function for the conversation you are engaged in. Accelerometer motion control! Shake the phone to change the wallpaper or song track playing. Luks like a great phone, havent actually had a chance to use it yet ... but its a fregn gud lukn phone, impressive features ... will post again as soon as we start using it. very good phone ! good sound quality ! loud sound! phone very usefull!